Wifestyles Blog & Photography: 6 months of newlywed bliss! 6 months of newlywed bliss! On the 27th Justin and I celebrated our 6 month anniversary! I seriously can't get over how fast the last 6 months have passed us by! We've had such a great start to our marriage so far with great adventures in house remodeling, new job opportunities and very exciting upcoming trips/events! :) It's everything I hoped for and imagined it to be! I'm so excited for everything that is in store for us and our future together! I thought it would be fun to share with you some of my favorite, little things about being a "newlywed!" Let's begin with cuddle fests that take place every night! he's my personal heater and I get to take with me wherever I go! Happy 6 months of marriage babe! :) I hope you enjoyed it as much as I have! you only have a lifetime left with me. That cuddle cartoon is so true, but the other way around! Hubs is all up in my biz-nass! I'm so happy to see other women loving to take care of their man. I know it's so traditional, but what was so wrong with it? I love your cartoons. Happy 6 month! It does go by so fast. awww congrats! Love these pictures. 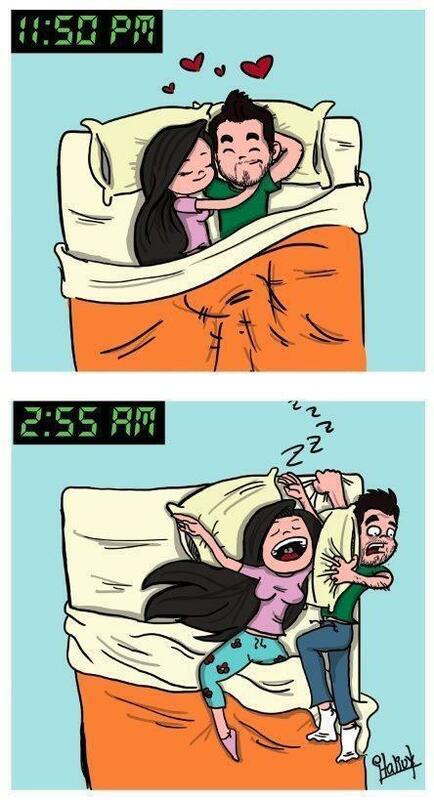 Lol the cuddle cartoon is so funny, because it's so true. My husband and I go to bed all good and once he starts to snore or come to close in the middle of night I'm ready to throw him off the bed. Lol. I love your blog. You are the cutest thing! I am a newlywed as well. I just got your comment and I'm following you on Instgram! ;) Hope you have a great weekend! P.S. Love what you did with your living room. Looks fab! I can't believe it's already been 6 months! You two are just PRECIOUS! Yay for 6 months! Our 6 months is next month, craziness.... And yes the sleeping situation is the exact same in our house!! You're not alone on that one! Too sweet!! Happy 6 month Anniversary!! Happy 6 months, sweet lady! Happy 6 months! The bed pics cracked me up! Wow that 6 months flew by! Happy 6 months!